The Movie 'Dora's Dunkin Donuts'. Internet Archive Movie Archive is a good choice for streaming and downloading free movies because there are many to choose from and you can do so from your computer or mobile device. Keep reading for my review of Internet Archive Movie Archive, where you can learn about the quality of the videos, what I think of the mobile app, and more. Internet Archive has lots of movies, but unlike similar movie streaming sites that have a nice collection of genres to organize the films, there are dozens upon dozens of categories here, many of which repeat each other. If you access the Browse by Subject / Keywords section of the website, you'll find all the categories that movies are listed in. There are certainly recognizable genres, such as Comedy, Sci-Fi, Horror, Drama, Documentary, etc, but you can't view them all in one place, which is unfortunate. For example, there are dozens upon dozens of "drama" categories but instead of being collected and organized into one drama section, they're spread out everywhere on the page. Because Internet Archive lets anyone upload videos to their website, I have found that the quality of most of the movies aren't even as good as a standard DVD. There may be higher quality films here, but the ones I came across were nothing to be excited about. 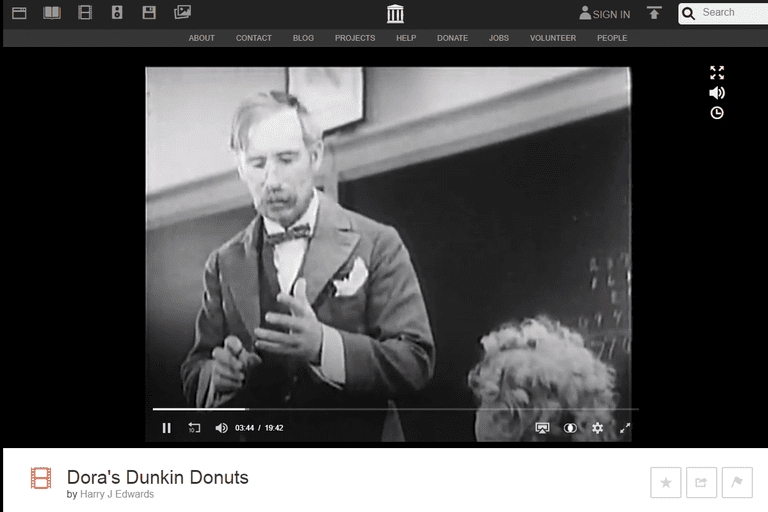 With movies found on Internet Archive Movie Archive, you can embed them on other websites as well as share them over Facebook, Twitter, and email. The buttons for these options are revealed when the mouse pointer enters the video player. You can also view related videos and open the movie in full screen mode. Something else you can do with videos from Internet Archive Movie Archive is download them to your computer, which is a feature you won't find in most other streaming movie websites. Below most videos is a section called "DOWNLOAD OPTIONS" that holds the video file download link and other things like a torrent link. I didn't run into any in-video advertisements of the several movies I tested at Internet Archive, which is spectacular considering most other movie streaming websites show tons of ads, such as with Sony Crackle. However, these two sites that do show ads have better quality videos than the ones here at Internet Archive. So I think it's only acceptable to not display ads here, but do so on better websites. I had absolutely no problems with videos pausing or stopping on me. I tested many films, fast forwarding, refreshing, and rewinding them, and none took too long to load in my browser. If your Internet connection is too slow or you're trying to watch multiple movies at once, it's possible they could pause on you while trying to buffer, but experience will definitely vary. A free movie app is available for the films at Internet Archive Movie Archive, but it's not an official app released by the website. You can find the newest and most popular movies as well as sort them by subcollection and hand picked films by Internet Archive. While the app is functional and shows all the same videos as the desktop site, I do find it a bit hard to maneuver through. Also, I had some trouble playing a few movies on an iPhone while the same films played just fine on the desktop site. I recommend Viewster, Yidio, SnagFilms, and Popcornflix if you're looking for a better mobile app for streaming movies. I like using Internet Archive to watch free movies because there aren't a lot of advertisements, the videos load without problem, and there's a mobile app that you can use for watching movies on the go. Of course any website or service will have its downfalls, but I think the greatest thing I really dislike about Internet Archive is that the sheer number of content on the site plus the lack of organization can make it difficult to browse for movies.